Legislation concerning the proposed new VAT regime is "imminent" according to Financial Secretary in the Ministry of Finance John Rolle, speaking at a Bahamas Chamber of Commerce and Employers' Confederation luncheon yesterday. Legislation concerning the proposed new value added tax (VAT) regime is “imminent,” according to Financial Secretary John Rolle, who said yesterday that the government was “sensitive” to the business community’s impatience to see the regulation, and promised that it would be made public “very soon”. 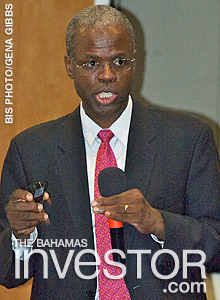 Speaking at a luncheon hosted by the Bahamas Chamber of Commerce and Employers’ Confederation (BCECC), Rolle said widespread tax reform was necessary in The Bahamas to address the widening gap between the government’s expenditure and its revenue. Wayne Lovell, senior director of tax for KPMG Barbados, also spoke at the event, which took place in the British Colonial Hilton. He warned businesses to ensure their staff were adequately trained and advised them to invest in consultancy services if necessary. “Make sure you have at least two people that are familiar with the filling of the VAT returns,” he said. As the countdown continues to the VAT implementation date, the government is working with the Bahamas Institute of Chartered Accountants to deliver training, workshops and seminars throughout the country. Representing the private sector, the BCCEC has formed a coalition for tax reform that will report to government. The new Domestic Terminal at Lynden Pindling International Airport welcomed its first customers yesterday, as the redeveloped facility started operations. Watch a ZNS Network news report here. Minister of Transportation and Aviation Glenys Hanna-Martin delivered an address at the official opening of the final stage of the redevelopment of the Lynden Pindling International Airport last week. Watch excerpts from her speech here.